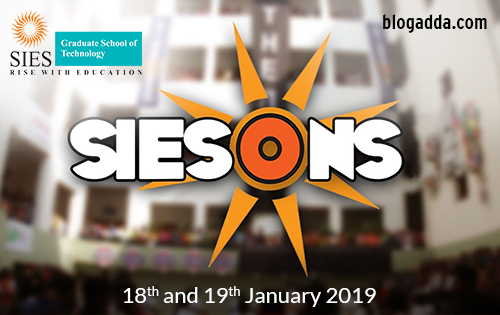 SIES (Nerul) College of Arts, Science and Commerce is gearing up for it’s upcoming annual inter collegiate festival SIESONS which is to be held on 18th and 19th of January 2019. It is well known for it’s extravagant and pompous theme release and this year was no less. The event began with the students grooving to the sound of 30 dhols creating a vibrant atmosphere in the college. Principal Mr. Milind Vaidya lit the lamp invoking the blessings of the God. The students performed well choreographed synchronized dance to the pepped beats keeping the audience occupying four floors of the campus well entertained. The number one unplugged and Indie rock band based in Mumbai, Sanyaas. The band graced the event. The pulsing crowd and energetic performances certainly bowled him over. ‘It was amazing to witness the energy, the unity, of everyone who took part. The fact that each of these college students were not performing for themselves, instead were enjoying each other’s performances, lifting each other’s morale is something you don’t get to see out in the real world’, said the lead singer, Manmeet Singh. The dances by students portrayed various emotions like breakup, passion, joy, friendship, hardwork, love, etc. The Theme for this year is ‘Era of discoveries’. The theme showcased how everybody involved in the fest discover their inner hidden talents. ‘We work very hard to put up the event, and it is heartwarming to get a positive response for all our hard work’ said the Media PR Head, Shambhavi Dalvi. Sounds Interesting! I should visit this event. Amazing guys i will go this event and enjoy this event. Thanks for sharing this event news.